How much do writers read? Fabulous question! Aside from the more general reading of wikipedia entries, tweets, and ice cream labels, writers read on average entirely too much. We are the kind of people you can take into a bookshop and it will take less time if we were point to the books we haven't read because there are, like, three of those. We are the kind of people who always carry a book around wherever we go, in one form of another, just in case the apocalypse happens because if you can't stop the world ending you might as well have a great book to read. How much do writers write a day? People of the Internet, you are full of the fabtacular questions today! Like the amount of photos an artist takes in a day, or the number of clouds that pass you in an afternoon, words will vary. Word count will also depend on your definition of the term day, words, and caffeine-overdose. Some people can write as much as 8000 words a day, and some write only 8, but it is not the quantity that matters. It is the meaningfulness. And nobody has meaningfulness counters on their word docs yet so, basically, who knows? 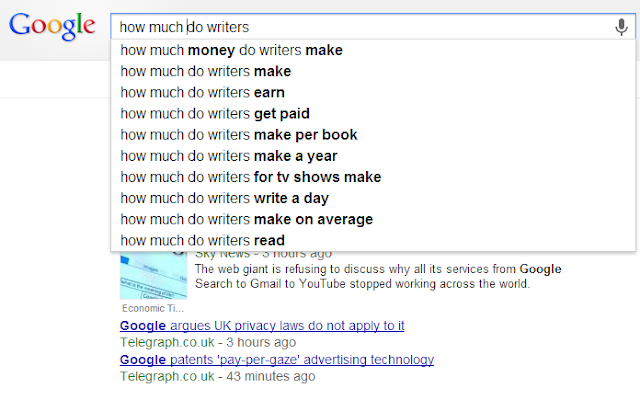 How much do writers make per book? Haha. I see what you did there! Mmm! So per book is a hard question on account of the fact you'd have to divide by the number of books published and for me that number is zero, and I don't know if you know this or not but dividing anything by zero results in a catastrophic time-space anomaly that will eventually crumple the entire universe into something akin to a shredded bank statement. So. You still want me to do the calculations? How much do writers get paid? Okay! Fine! Here's the deal, writers often don't get paid anything for the words. Fiction writers are not authors yet, you see? But we do get paid in loving emails, friendly hugs, and also more often than not for day jobs that we all have. These may or may not be writing related jobs! People are such complex constructions, you know that, so it's okay to love your job in astro-physics and also love writing historical westerns with a view to publishing. So, don't worry, we do get paid in real money but also for writing most often we are paid in the satisfaction of a job well done, and the hope of a book soon sold. How much do you read/write/make/care?